Brian Kuszmar enviou-nos as mais recentes NEWS sobre o campeonato norte-americano de waveski. Decorrerá nos dias 1,2 e 3 de Outubro no famoso spot Sebastian Inlet, Florida, e conta com o nosso apoio. Em cima, vemos uma foto fantástica de Tony Cherry - já entrevistado por nós - que se sagrou vencedor da edição do ano passado. October 1st, 2nd & 3rd 2009 at the World Famous Surf Break Sebastian Inlet, Florida the United States Waveski Association will hold our annual US Championships. The United States Waveski Surfing Championships are held yearly to determine the rankings of the best waveski surfers in the United States. The US Championships has competitors from all over the world trying to take home the coveted Open Championship Trophy. Last years 2008 Championship event held at the world famous “C” Street Break in Ventura, California saw Tony Cherry, from new Zealand, win the US Open! Waveski surfing is a dynamic form of surfing where the rider is seated and strapped on a craft that resembles a surfboard with a seat and foot-straps. The riders paddle into and surf on waves as big as 12 to 15 feet strapped to a 7 to 9 foot board with a double sided paddle in hand. Waveski surfing is very similar to regular surfing except the wipeouts are bigger, more spectacular, and the maneuvers leave most new spectators wondering, “how did he do that.” Paddle surfing in one form or another is becoming one of the fastest growing watersports in the world and boasts an age demographic from 10 years old to 70+ years. The average age of most competitors is in their 30’s and most travel frequently to surf all over the world. For more info on Waveski Surfing go to http://uswaveski.com or to see video of Waveski Surfing, simply go to YouTube and type in “Waveski”. “I think this single contest brought a renewed found vigor for paddlesurfing and the possibilities to not only the West Coast scene but, to the USA scene. AWESOME and can’t wait until the next one,” Vince Shay, Ca. 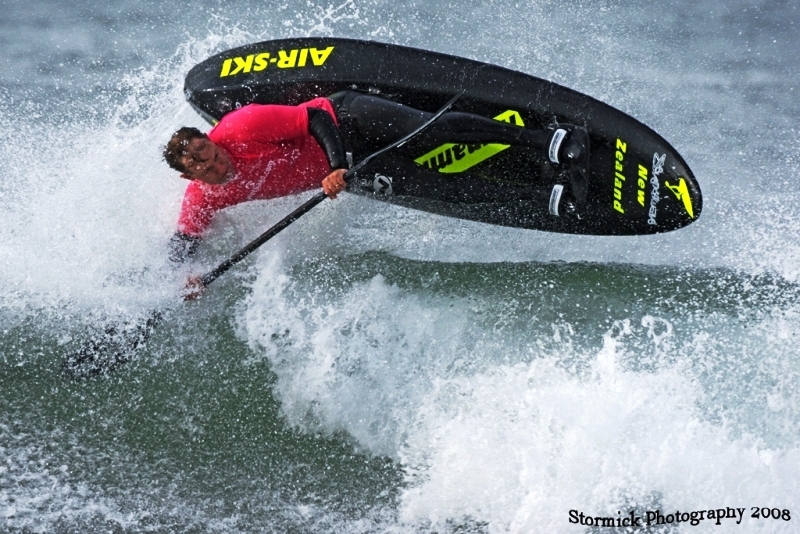 “If you weren't in Ventura for the US Waveski Championships you missed the best waveski contest on the west coast since the 1989 when the World Cup was held in Huntington Beach.,” Roger Adams, Ca. “This contest, for me, was a highlight in my surfing life. The competition was so well organized and all of the people made me feel so welcome it was a pleasure to compete,” said 2008 champion Tony Cherry, New Zealand. This year, for the 2009 US Waveski Championship, we intend to put on even a better show! The Waveski Surfing event is free for public viewing and will be held at the Sebastian Inlet State Park. However, the State Park does charge a nominal entry fee.